Bees are remarkable little creatures with a complex social dynamic and amazing ability to produce delicious honey. Bee colonies are quite vulnerable to environmental change and habitat destruction. Looking closely at exactly what happens during a bee’s first days of life reveals just how magical and amazing their development process is. This fascinating video footage was presented at a TED 2015 talk by Anand Varma, who raised bees in front of the camera in his own backyard in Berkely, California as a part of a project for National Geographic. In only 6 minutes, it shares so much important information about the buzzing, furry creatures we know and love. One of the biggest threats to bees is a species of mite that hails from Asia. By sucking the blood of young bees, they weaken the bees’ immune systems and make them more susceptible to disease. In the TED video, you can see the damage the mites do firsthand. The footage begins when the bee hatches into a larva, which takes its place in a special cell where it will develop into a mature bee over the next 21 days. The larvae feed on a white gel that adult bees secrete for them. Slowly, the larvae develop heads and legs, as they cross over into the pupae stage. At this point, the mites are quite active, beginning to feed on the young bees. 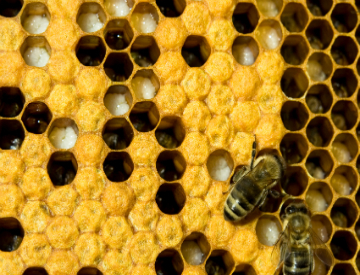 Pigment develops in the eyes, and the bees’ skin shrivels as they sprout hair, becoming adults. At Paradise Meadows Orchard & Bee Farm, we rely on these bees to produce our raw honey from Hawaii, and to pollinate all of our crops, including our award-winning Ka’u coffee. We use sustainable practices, and we never heat or chemically process our honey. Visit us to try our raw honey from Hawaii for yourself, and enjoy the fruits of these beautiful bees’ labors.